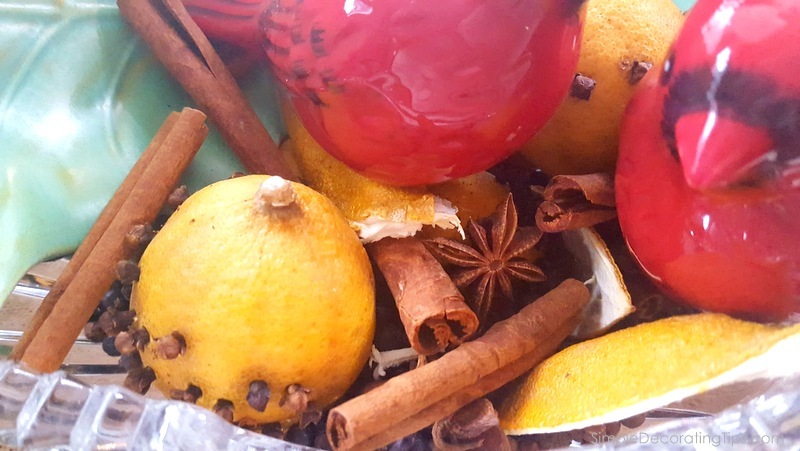 I love the aroma of citrus, cinnamon, cloves and wonderful spices filling the air of our home… Sadly though, if you’re like me, artificial scents and perfumes can trigger life-halting migraines that’ll linger for days. That’s why I’ve been learning to make my own totally 100% all natural potpourri. It’s interesting how after going perfume and artificial scent free for so many years, I now easily can smell the artificial stuff, and it’s not a good thing! That stuff smells so heavy and gaudily fake to me. I am pretty conscious of trying to not pollute my home with stuff that’s bad for me and my family. I just really wonder how healthy some of the things we think ‘smell good’ really are. so what’s in the air, stays in the air… for a long time! This year, I made a large batch of this natural potpourri and have some in the dining room and some in the kitchen. It’s not so strong and overbearing that I feel like I need to move it when I’m serving food by it. Instead it’s a nice natural scent of gentle whiffs that breeze by every so often. I started out with some lemons that have dried nicely after I had studded with cloves a couple months ago. Then I added several different spices, all of which I bought in bulk. It’s so much less expensive to get them in bulk. you need to slice them open. This is what it looked like once it was sliced open. That wonderful rich vanilla odor filled the area as soon as I sliced into it! I threw in some orange peels that were drying from a few days prior. Lastly adding some cinnamon sticks, and adding in some more loose whole cloves. The natural potpourri smells so nice. Every so often I give it a little stir to release some extra smell, but it does softly smell all on it’s own. In the dining room, I have it in this large crystal bowl my grandma gave me. I’ve added some vintage ceramic holly leaves and a pair of red cardinal salt and pepper shakers I found at Wal-Mart a couple years back. Another addition that would be nice to add are snips of cedar or balsam branches… they would look pretty and smell great. I hope you try it out and are able to enjoy the beautiful, natural scent for your home.